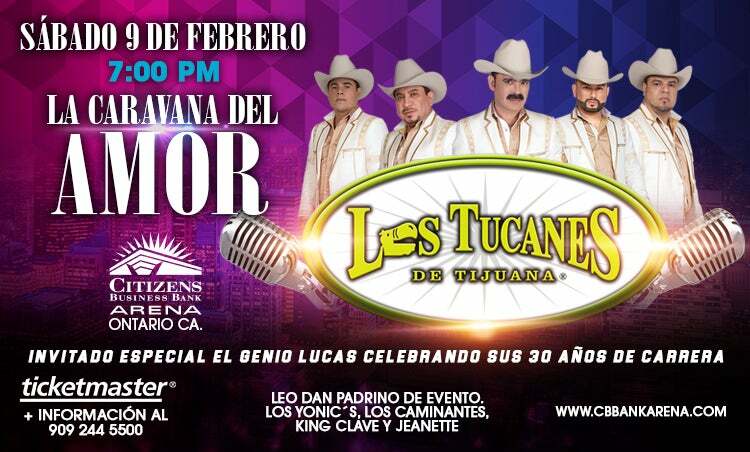 With an extraordinary lineup, “La Caravana del Amor” arrives to Ontario, CA, a special evening where Los Tucanes de Tijuana, Leo Dan, Jeanette, King Clave, Los Yonic’s and Los Caminantes, will fill with romanticism and joy at Citizens Business Bank Arena in the city of Ontario, California on Saturday, February 9. Popular band, Los Tucanes de Tijuana, will headline this special evening and will surely encourage attendees to dance to the rhythm of some of their greatest hits, including their most popular songs such as “La Chona,” “El Tucanazo,” “El Águila Blanca,” “Mis Tres Animales,” among many others. It’s important to note that the group became an online sensation in 2018 with the fun trend known as La Chona Challenge. Also, Jeanette, considered one of the best singers of the 70s earning over 60 Gold, Platinum, and Diamond records, will raise her outstanding voice to sing her most famous tracks, “Por qué te vas,” “Soy Rebelde,” “Frente a Frente,” “Corazón de Poeta” and “El Muchacho De Los Ojos Tristes”, among others. Popular Argentine performer, King Clave, recognized for his songs “Los Hombres No Deben Llorar,” “Mi Corazón Lloró,” and “Por Esas Pequeñas Cosas,” will also be part of the spectacular lineup, which will also serve to celebrate El Genio Lucas’ 30 years working as a radio personality. Tickets are already available through www.Ticketmaster.com and the Citizens Business Bank Arena’s box office.